In case you had the impression that the most luxurious ski vacations can only be found over the pass in Vail or Beaver Creek, think again. 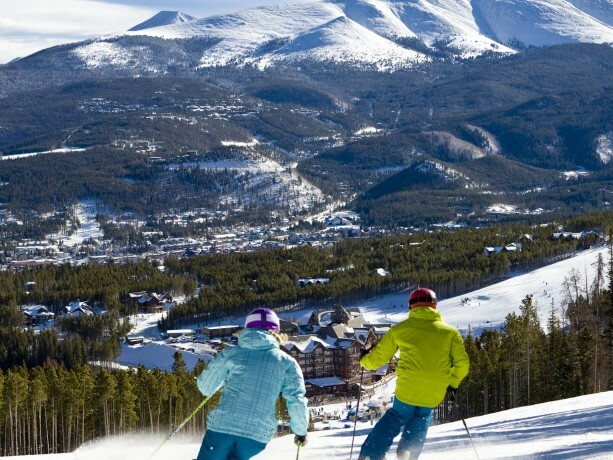 In recent years especially, Breckenridge has become home to some of the world’s most well-appointed options not only for downhill terrain but also for dining, lodging, shopping and general indulgence. One Ski Hill Place: As far as being close to the slopes, you couldn’t possibly have faster access to the morning’s first chair up the mountain than right at the base of Peak 8. From studios to four-bedroom condominiums, Ski Hill is big on fireplaces (there are a couple of huge three-sided hearths in the lobby and also on the heated outdoor deck), private patios and balconies and enormous windows with magical views in every direction. The gym features state-of-the-art equipment to rival anything you’d find at top metropolitan fitness centers, an aquatics center with two indoor pools and outdoor hot tub –accompanied by yet another fire pit. Room service is available from 7 a.m. to 10 p.m. daily and One Ski Hill boasts three restaurants – The Living Room, open for breakfast, lunch and dinner, outfitted with a lounge area full of plush sofas and chairs for sipping wine and appetizers, the family favorite Ski Hill Grill and The T-Bar, the hottest place in town for happy hour and après ski. If this all sounds delightful but relatively up to par for your standard five-star, ski in/ski out lodging experience, One Ski Hill also has its own bowling alley. The aptly named Mine Shaft will temporarily make you forget you’re on a mountain as you knock back pins and any drinks and snacks you’d like from the hospitality menu. 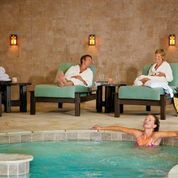 Of course, after your muscles are wearied by a day of charging through powder on Breck’s newly expanded terrain, nothing hits the spot like the spa, and Ski Hill’s Rejuvenation Center offers everything from stone massages to full body hydration treatments. It’s really not necessary to leave the premises whatsoever, but in addition to its location steps away from the means up the mountain, the 5-minute gondola ride down to town is right outside the door as well as a curbside shuttle. There is no dearth of restaurants in Breck – fine dining, included – but the top choice for a scrumptious dinner can be found at one of the town’s longest standing mainstays. Nestled into a charming Victorian home on Ridge St. that dates back to the 1880s, the atmosphere at the Hearthstone feels more like a relaxed, cozy evening in the home of upstanding relatives rather than a white tablecloth joint. 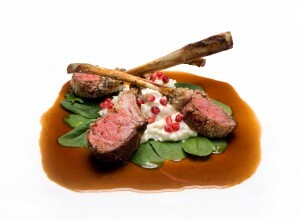 The dishes range from Colorado-raised choice game to tender fish, and chef Michael Halpin’s culinary training in his native Chicago and time designing menus in Hawaii has taught him that the quality of the ingredients speak for themselves, meaning everything is perfectly cooked and simply succulent, never over-sauced or over-seasoned. Definitely save room for dessert (hot bread pudding with berry sauce, anybody?) and play around with the 220 bottle options on the wine list while watching the lights of the Sno-Cats move up and down the mountain in the distance. Deciding where to go on a big mountain – especially one that’s adding a whole new peak to its terrain this season – can be a challenge, which is why it’s a relief to let someone else do the navigating. Private lessons mean an instructor suited to your ability level, customizing your entire experience to your personal needs and wishes while teaching you to be a much better skier or rider along the way. Not only does Breck Sports carry the latest and greatest skis and boards for purchase, rent or demo, but it’s also the place to find that souped up helmet with top-of-the-line speakers, top-end taped jackets and snow pants and a huge variety of gloves, goggles and accessories. Not nearly as basic as its name implies, Goods matches strides with the newest trends you’d find in New York’s SOHO, only this little boutique is situated smack in the middle of Main Street. From chic shoulder bags by George Gina & Lucy to Johnny Was dresses, Inov8 sneakers and Blundstone leather shoes to Biya Natalia designer hoodies, Goods is your best bet for styles that will work well beyond your days in this awesome little ski town. If you are shopping for a token piece to add to your collection – anything from a Colorado-inspired bronze mountain lion or oil rendition of aspen groves to unique paintings and sculptures from contemporary artists around the world, Breckenridge Fine Art Gallery is the place to look. If you prefer to hone in on more eclectic pieces rendered solely by Colorado’s top artists, check out the unique collection at Art on a Whim. © 2012-2014 Vail Resorts Management Company. All Rights Reserved.